The audience at the Monterey Jazz Festival in 1966 had no idea they were witnessing one of the most historic recording sessions in the annals of jazz. The recording of the set that day by The Charles Lloyd Quartet would soon become one of the biggest jazz hits of the era. 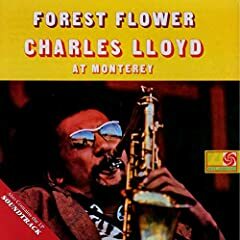 The resulting release, Forest Flower became one of the first million selling jazz records and catapult Lloyd into the forefront of the 60's musical scene. The Quartet became a fixture on the psychedelic ballroom circuit and initiated many young rock listeners into jazz for the first time. In honor of the 40th anniversary of that remarkable recording, Lloyd and his acclaimed working quartet-pianist Geri Allen, bassist Reuben Rogers and drummer Eric Harland-revisit the classic music at this year's 49th Monterey Jazz Festival on the opening night of the three-day affair, Saturday, September 16 at 8pm on the Jimmy Lyons Stage in the main arena at the Monterey County Fairgrounds. Click here to read the entire post at eJazzNews.com.